Become A Volunteer - Managers, Coaches and Umpires. To become a volunteer, follow a few easy steps. 1) Go to the CVLL Registration Page and log in. 2) Sign yourself up as an adult volunteer by clicking the "Register Now" button next to your name. The Clayton Valley Little League is operated solely by the help of volunteers. The majority of help comes from the parents of the little leaguers, but you don't need to be a parent to volunteer your time! 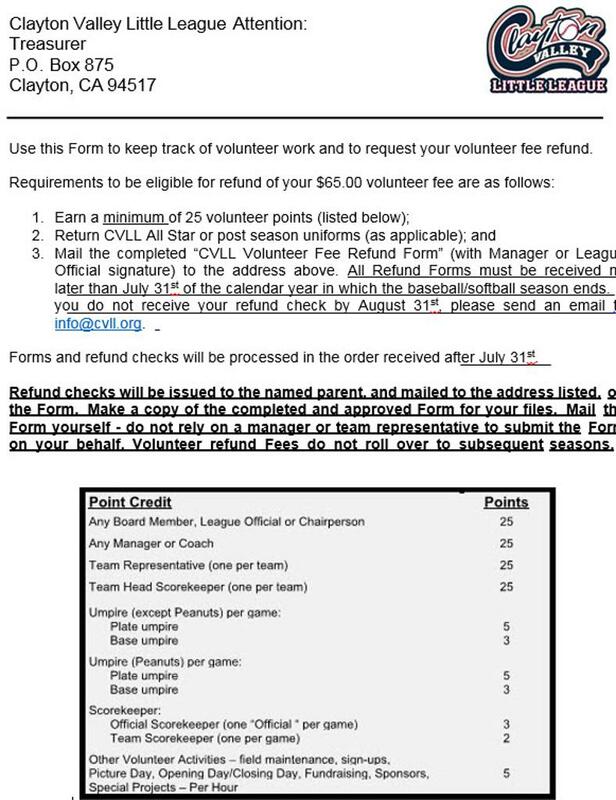 There are many opportunities to volunteer for the League. Each family is required to participate. Some activities like coaching or serving as a team parent, are regular commitments. Some only require occasional service. If you have a unique idea, please contact your Division Head or the League President.